In contrast to what many people believe, we have no authentic physical artifacts confirming the gospel stories, nor descriptions of Jesus from any of his contemporaries. Even the gospels themselves never claim to be eyewitness accounts. Scholars now believe that the stories of Jesus’ life and ministry that have been handed down to us—both within the Bible and outside--were written decades (or more) after Jesus would have lived, by unknown authors. This means that Christians have been free for almost two millennia to depict Jesus in a form that best suits their own culture and purposes, and they have. Also, at least some early Christians believed Jesus was quite ordinary in appearance. Justin and Tertullian cited words they believed to be a prophecy from the book of Isaiah: "He had no form nor comeliness, that we should look upon him, nor beauty that we should delight in him” (Isaiah 53:2). In the Quran, Mohammed flies to Jerusalem where he meets with Abraham, Moses and Jesus, and Jesus is the smallest of the three. Other early writers describe Jesus as slight, ordinary, and even unattractive. 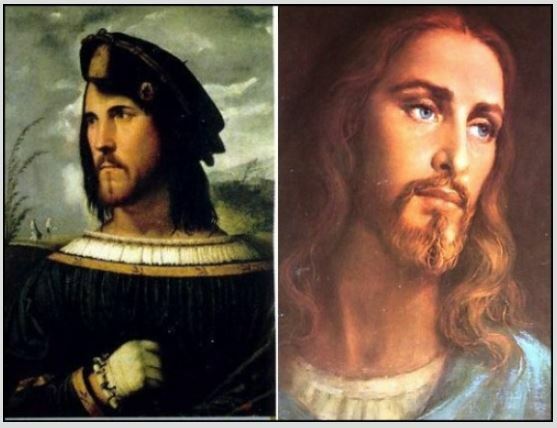 These writings cannot be assumed to give a picture of any actual historical Jesus, but they do reflect images circulating at the time they were written. His hair is the color of a ripe pecan which comes to his ears, and from there it falls into graceful waving curls that cover his shoulders, turning into a brilliant reddish earth color. It is parted in the center from the crown according to the fashion of the Nazarenes. His forehead is smooth and serene, his face is without wrinkle or spot, his nose and his mouth are formed in exquisite symmetry. His beard is thick; the same color as his hair, not long, and it is separated in the center. His eyes are exceptionally sweet and calm; they are serious and inspire fear; they have the power of the sun's rays. No one can stare straight into His eyes. . . . He has the most perfect body in the whole world. He is a man of extraordinary beauty and divine perfection and exceeds in beauty all of the sons of men, as does his mother, who is the most beautiful woman ever seen in these parts. “Mommy, why are we the only white people in the Middle East?”In this context—the absence of physical or eye witness evidence, the evolution of Christianity, the fusion of Christianity and political power in Rome, and the convergence on a regal, beautiful Jesus—we can return to the Borgia story. More broadly, the story says something about each person’s tendency to create God in his or her own image and in the words of Anglican theologian Charles D. Hackett, to “appropriate him in the service of our cultural values." In an effort to distance themselves from the image of a Semitic Jesus some conservative Christians have even laid out the following (transparently self-serving) argument: Since God impregnated Mary, he must have “fashioned the necessary genes and chromosomes that could be the vehicle of Christ's person in uniting with those in the body of the virgin." This means Jesus had some unknown kind of DNA that came straight from God, and so he could have had any shape of face, eye color, skin tone, build or height. Ergo, there’s no reason to assume that he looked like a typical Palestinian Jew.